The FICC business is not going away: corporates will issue bonds, asset managers will buy them, and both will use derivatives for hedging and asset-liability management. The global revenue pool in 2014 was ~$120bn (of which the top-5 US players had ~40% share) down nearly 50% from 2009, but still substantial. The challenge for the industry is over-capacity as players have waited for cyclical improvement, particularly from zero-bounded interest rates, and under-reacted to secular change including a dramatic increase in balance-sheet costs and the margin-squeeze from the shift from OTC markets to exchanges. To date, capacity-reduction has been highly selective so that return-improvement is limited to commodities, credit default swaps, and balance-sheet intensive products including long-dated derivatives and some financing business. However, an increasing focus on FICC return over revenue is leading to more sweeping capacity announcements particularly in Europe, where banks have a return-gap of 2-3% versus US peers, but also in the US as indicated by the announcement from MS (cutting 1,200 jobs, or 2% of global workforce, including 470 in FICC) as a follow-up to November comments from management that “we have too much capital in the FICC business for the return”. Deutsche Bank: As late as June, management commented that “it would have been folly for use to have done that [exited fixed income]” in contrast to CEO John Cryan’s remark yesterday that “in fixed income, we’ve wrought for ourselves a competitive advantage by a willingness to use a lot of leverage to win business… [and] we are having to wean ourselves off that”. Barclays: Investment bank CEO Tom King has highlighted the move, beginning in mid-2014 “from being a balance-sheet, revenue-focused investment bank to much more a returns-based model” including a smaller macro business and, in refreshing strategy this July, new Barclays CEO John McFarlane noted that the investment bank “is likely to use less capital” and be held accountable for delivering “sustainable results above the cost of equity”. We see GS as the beneficiary. It acted early to reduce capacity and, since 2013 (when Basel 3 was introduced), has cut headcount by 10%, risk-weighted assets by ~one-third, and the FICC balance-sheet by ~20%. At the same time, the firm has invested in the FICC business reportedly paying top-dollar for talent and, as commented in our note of 9/2/2014 titled “Enterprise-Wide Risk Management Systems in Derivatives Pricing”, making market-leading investments in a single and unified risk management system to support advantaged pricing and balance-sheet management. The announcement by Morgan Stanley that it will cut 1,200 jobs representing 2% of the global workforce and including 470 jobs in the FICC business confirms that capacity is coming out of the industry particularly at those firms – Morgan Stanley, Deutsche, and Barclays – promoting the heads of their equities businesses to run global sales and trading across both equity and FICC. While it has taken some time for these adjustments to occur, despite a dramatic increase in balance-sheet costs with regulation, a margin-squeeze given the shift from OTC markets to exchanges, and the adverse impact on activity and volatility arising from zero-bounded interest rates, we agree with GS CFO Harvey Schwartz when he comments that “we are starting to see really I think for the first time in the industry unprecedented announcements with respect to strategic change … mostly out of Europe but it’s pretty extraordinary at least what may potentially be on the horizon”. MS signaled capacity-cuts in mid-November when Colm Kelleher remarked “we have too much capital in the business for the return … and we do not have the benefit of a big market share like Chase” (Exhibit 1) even after reducing the common-equity allocation to its institutional securities business by ~15% since the adoption of Basel 3 (from $39.9bn in the March quarter of 2013 to $39.9bn in the latest quarter). Nonetheless, institutional securities accounts for 50% of firm-wide equity so that the year-to-date return on equity for MS is 12% despite mid- to high-teens returns from the wealth and investment management businesses. The firm acknowledges that “FICC is the drag and we have to solve for that drag … we have to take capital out of FICC and we have to look at trying to reduce some of the legacy drag”. While larger than MS, GS has a smaller FICC business than the dealer-banks but has been unequivocal about its commitment to the business and not argued that it is sub-scale with Harvey Schwartz commenting “we really take a much longer perspective … we feel very well-positioned … in all the factors that would make once successful in FICC: long experience in the business, the right global footprint, the right diversification of businesses”. At the same time, GS has been aggressive about getting in front of capacity reduction and since 2013 (when Basel 3 was adopted) has reduced headcount by 10%, risk-weighted assets by more than a third, and the balance sheet for institutional client services (ICS) by over 20% (Exhibit 2) mostly in FICC. 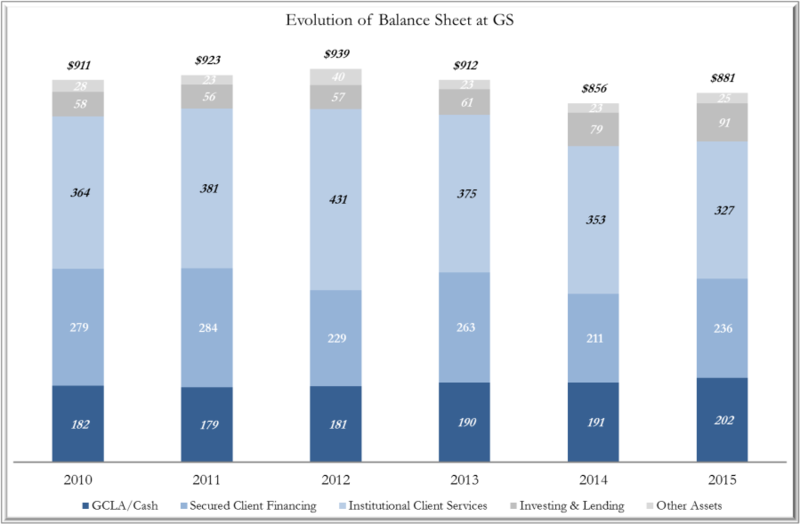 Indeed, ICS balances represent ~37% of the firm-wide sheet versus 45% in 2012. Furthermore, GS has continued to invest in the business reportedly offering the highest pay for talent and, as commented in our note of 9/2/2014 titled “Enterprise-Wide Risk Management Systems in Derivatives Pricing”, making market-leading investments in a single and unified risk management system in support of advantaged marginal deployment of the balance sheet. The firm has commented that returns are improving in some areas of FICC including the more balance-sheet intensive businesses (e.g. longer-dated swaps) and areas, such as CDS and commodities, where firm-exits have reduced competitive intensity.